Electric Sheep has re-launched in print as a quarterly magazine published by Wallflower Press. 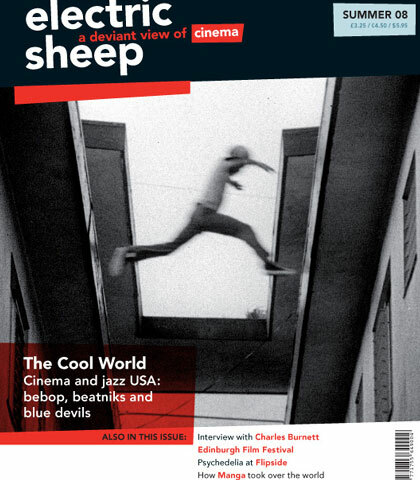 To celebrate the belated recognition of Charles Burnett’s jazz-scored monochrome gem Killer of Sheep the first issue explores the influence of jazz on American film with articles on Shirley Clarke, John Cassavetes, Jim Jarmusch, Beat cinema and much more! It is available from Wallflower Press for a 15% discount. We have a couple of jazz-themed tasters online: a review of the Chet Baker documentary Let’s Get Lost, which is re-released in UK cinemas on June 5, and an extract from the Charles Burnett interview published in full in the print magazine. As an extra, we also look at Space is the Place, a mytho-politico Blaxploitation sci-fi oddity starring Sun Ra and his Arkestra. We have reviews of Romanian Cannes prize-winner California Dreamin’, wonderful Gothic fairy tale Eyes Without a Face, French Jim Thompson adaptation Coup de torchon, Jerzy Kawalerowicz’s masterwork Mother Joan of Angels, which screened at the Polish Film Festival Kinoteka in April, as well as a Nagisa Oshima double bill with the radical political analysis of Night and Fog in Japan and the nihilistic youth movie The Sun’s Burial. To round it all up we finish with a discussion of ground-breaking animÃ© series Paranoia Agent. We also have a feature on the Tiger Festival, which is now under way at the ICA, London, and will move to Brighton on June 18. We talked to the brilliant programmers of Flipside who told us about their psychedelia night coming up on June 21, and to thoughtful animÃ© filmmaker Makoto Shinkai who will be attending the BFI’s AnimÃ© Now weekend on June 20-22. And we also have festival reports from Cannes and Udine Far East Film. In the Short Cuts section we preview what’s on offer at the Edinburgh Film Festival. In the Film Jukebox, we have Congregation, whose nerve-jangling, heart-stopping old-time blues has been wowing audiences across London for over a year.